Looking for my Readers' Workshop Lessons? Reader's Workshop provides students with a supportive environment that involves them in authentic reading experiences that focus on the strengths and needs of each individual student. 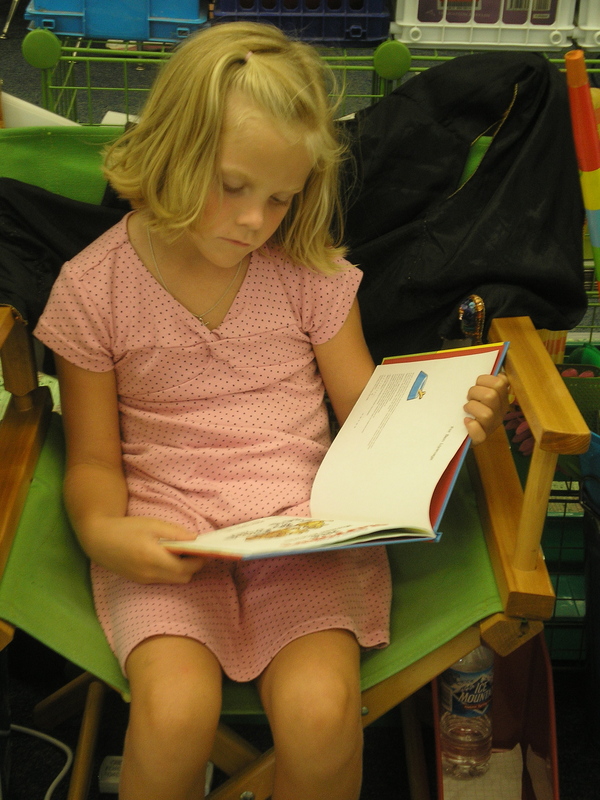 Reader's Workshop helps kids develop strong reading skills through the use of a mini-lesson, shared reading, read aloud, conferencing, independent reading, paired reading, literature response, and Reader's Chair. The basic philosophy behind the Reading Workshop is to allow students to spend an extended amount of time reading authentic texts that interest them on a daily basis and to provide opportunities to talk about literature. 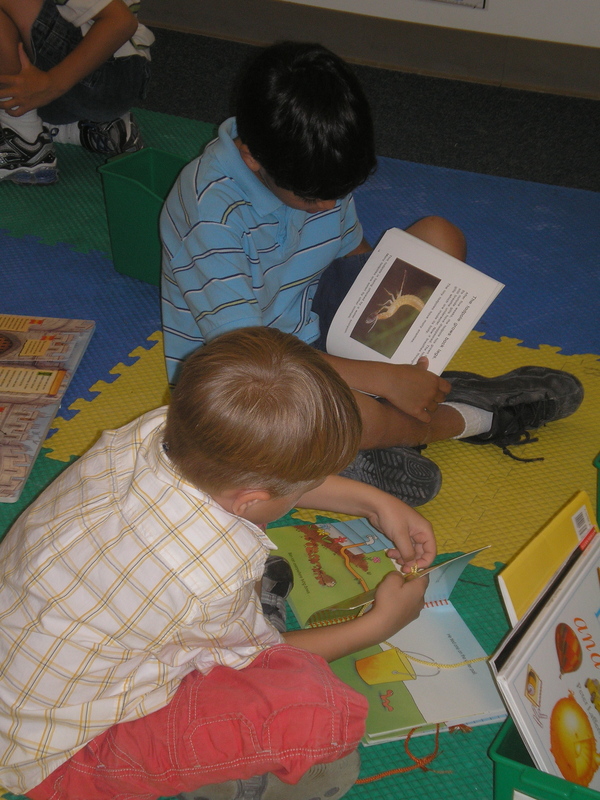 The ultimate goal of a Reading Workshop is always to develop life-long passionate readers. What are the components of Reader's Workshop? Reader's Workshop is an extended block of time devoted to reading, discussing and writing about reading. 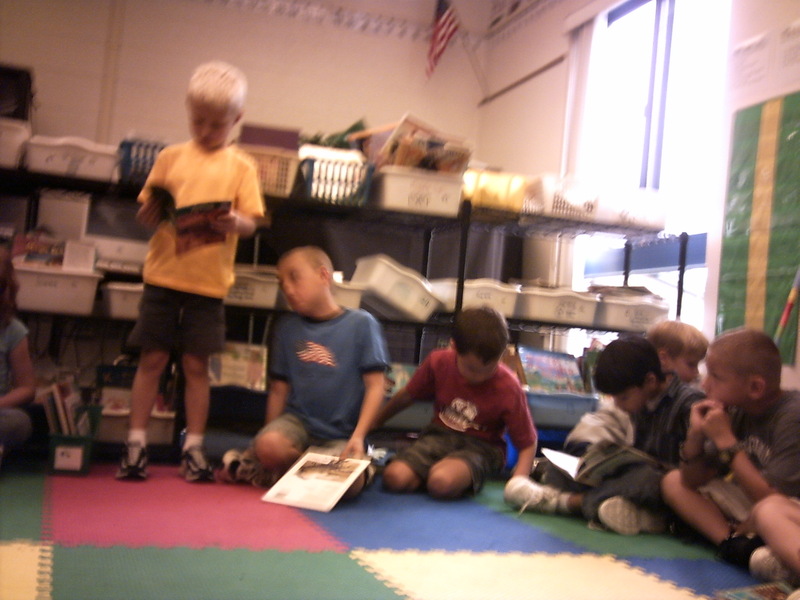 The workshop begins with a read aloud focused on a reading strategy and lasts approximately 20-25 minutes. It focuses on a skill, strategy, or behavior that will help students become strategic readers. The lessons are based on student need. During the lesson I model, read/think aloud using literature, use shared reading, or have students practice a particular skill or strategy. The mini lesson is followed by an extended period of work time in which children practice the strategy taught or work on an individualized learning target. Work time can last 20-60 minutes. After the work period children spread out for a 10 min. quick write in which they reflect on their work for the day and write about their thinking and learning. This quick write if followed by a sharing circle. Children gather in the group area to share their learning with others. Choice is an integral part of reader's workshop. During independent work times children choose what books they want to read and how they will work towards their learning goal. They can choose to work alone, with a friend, or in a small group. Choice gives children ownership of their learning. During independent reading work time, students apply what was focused on during the mini-lesson to their independent reading. 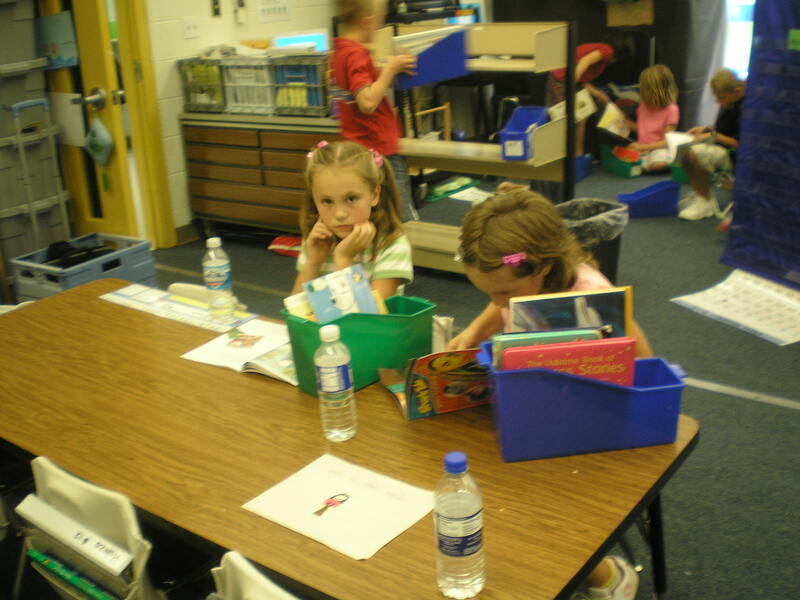 Students read books on their independent reading level and apply skills or strategies to their reading. During this time I observe and work with learners one-on-one or in small groups. 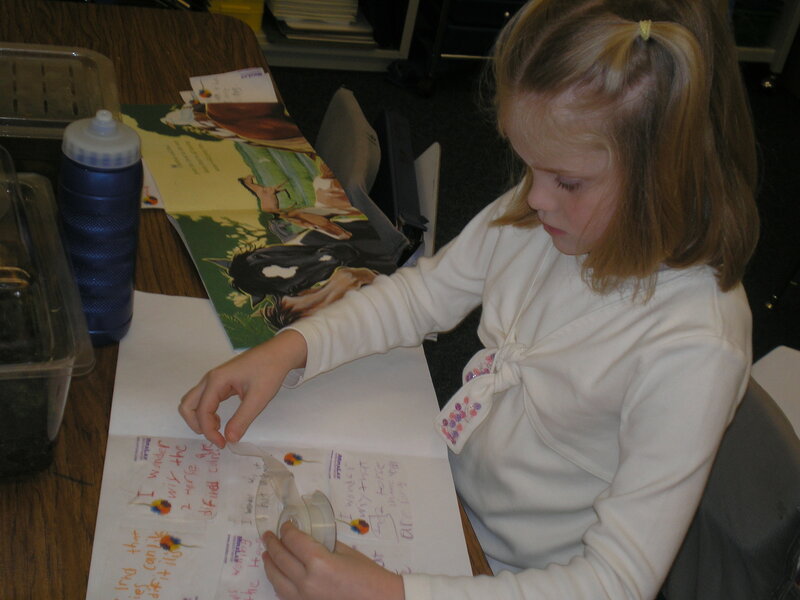 Learners keep a reading workshop notebook and are responsible for recording what they work on each week. In addition, I often jot down notes in the journal to track student progress or to encourage learners to work on a specific strategy or skill. Reader's Workshop ends with a time of reflection and sharing. Learners have the opportunity to share what they learned, what worked for them, struggles, exciting moments, and new discoveries. This sharing allows children to learn from each other and to take responsibility for their own learning. Reader's Workshop begins with a lesson that focuses on a strategy or skill children need to learn in order to grow as readers. We often start with a read aloud that I use to teach and model the strategy I want the children to learn. We create anchor charts that anchor or hold our learning so that we can refer back to them during our work time. See examples of our strategy and anchor charts. During the independent workshop time students choose how they will work (alone or with a friend) and find a place in the room to get to work. They start by checking their learning target on the target board so that they have a focus for their work time. Our class moto is "with great choice comes great responsibility!" The children learn that when they choose wisely they are in control of their choices. If, however, they do not choose wise work choices that reflect responsibility, then the teacher is forced to choose for them. The sharing circle follows the workshop time. During the sharing circle children have the opportunity to share their learning, their successes, questions or any problems they encountered during their work time. Sharing circle is often started by asking if anyone was able to apply today's mini lesson. Children can also share things that went well for them, things they discovered about themselves as readers, successes at sounding out words or model fluency by reading a short passage. Choice empowers! There are many ways in which children can be empowered with choices. Children choose books of interest. They choose genre. Reading choices also include whether to read a print book or a digital book. We have laptops, ipods, and ipads available to readers along with an extensive classroom print library. 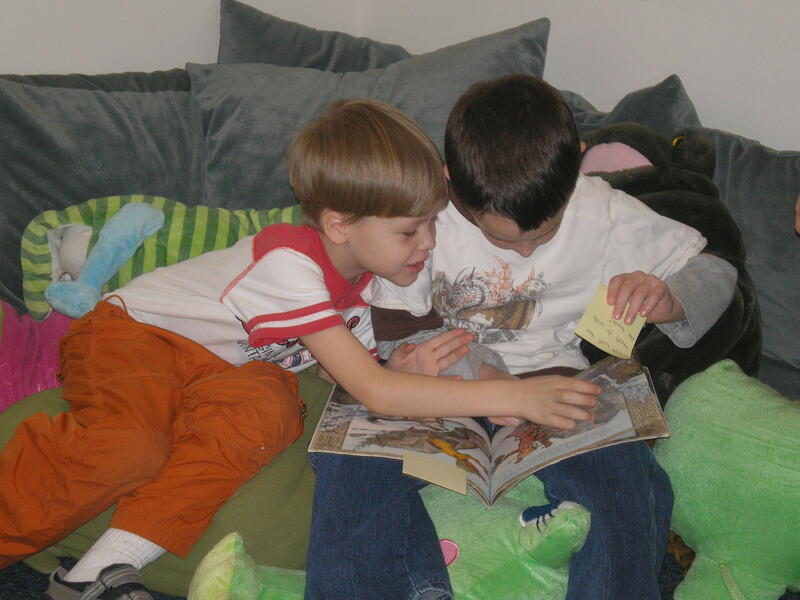 Children can choose to read alone or with a friend. They can choose to read in a small book club. Children choose a learning target with the guidance of a teacher. This gives them ownership of their learning and drives them toward success. Reader's workshop allows children to set goals and then spread their wings and take off into a world of learning. The Reading Faces board helps us set goals as we grow as readers. There are four areas of growth that we focus on: fluency, accuracy, comprehension, and expanding knowledge. As we learn new strategies they are added to the board. 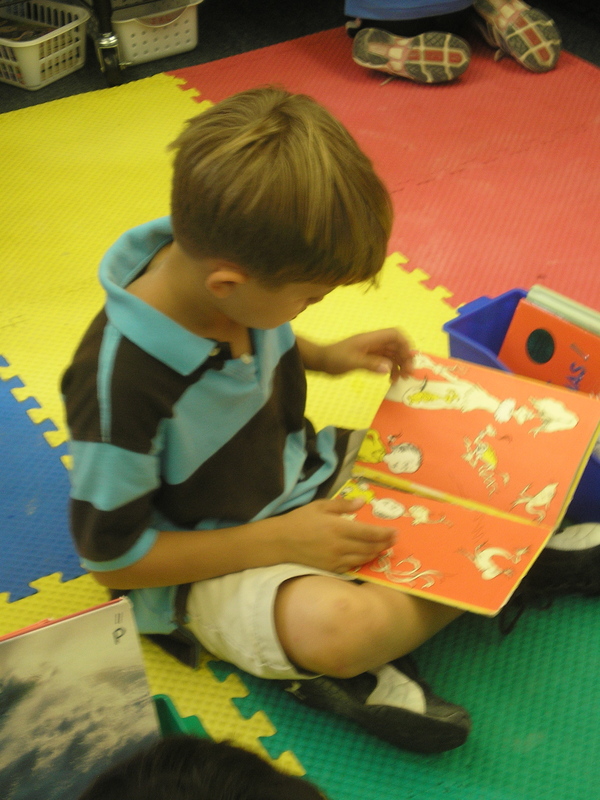 Each week children set goals and focus on improving their reading by practicing particular strategies. Each child has a magnet with their name on it. They place their magnet next to the strategy they are working on that week. Setting goals gives us focus and helps us stay on track. Fluency involves the smoothness with which we read. Fluent readers read with appropriate rate and tone. We work to become fluent readers. We don't want to read too fast or too slow. Fluent Freddy shows us how to make our reading smooth and flowing. Accuracy involves being able to decode words and recognize sight words accurately. Readers use a variety of strategies and skills to figure out unknown words. Accurate Ally teaches us the strategies we need to read the words in our books. Reading is thinking. We need to understand what we read. Cool Cat teaches us that thinking for understanding is what reading is all about. That's comprehension. If we don't understand what we read we really aren't reading. We learn many comprehension strategies. Elly Elephant teaches us to be learners when we are reading. 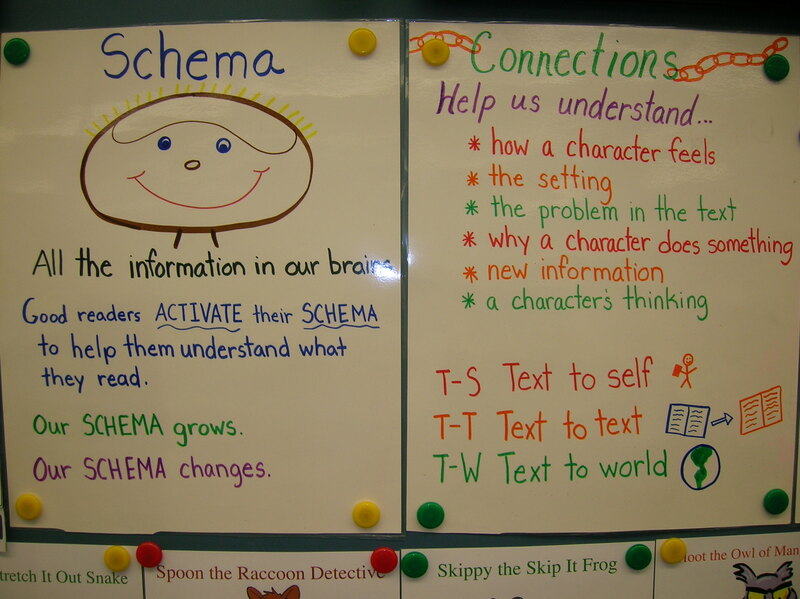 We are always learning new things and growing our schema as we read. There are many different ways that we can track our thinking, discoveries and show our learning. 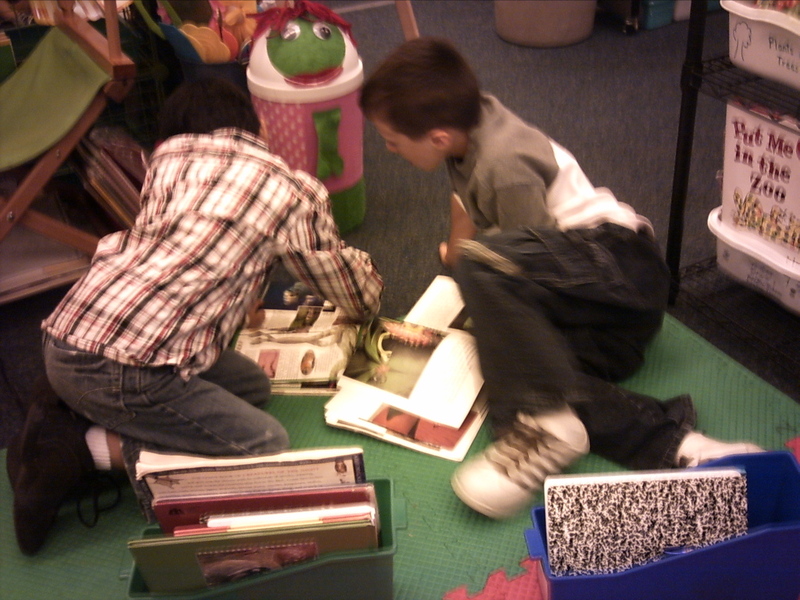 Each child has a reader's notebook which they keep in their book bin. 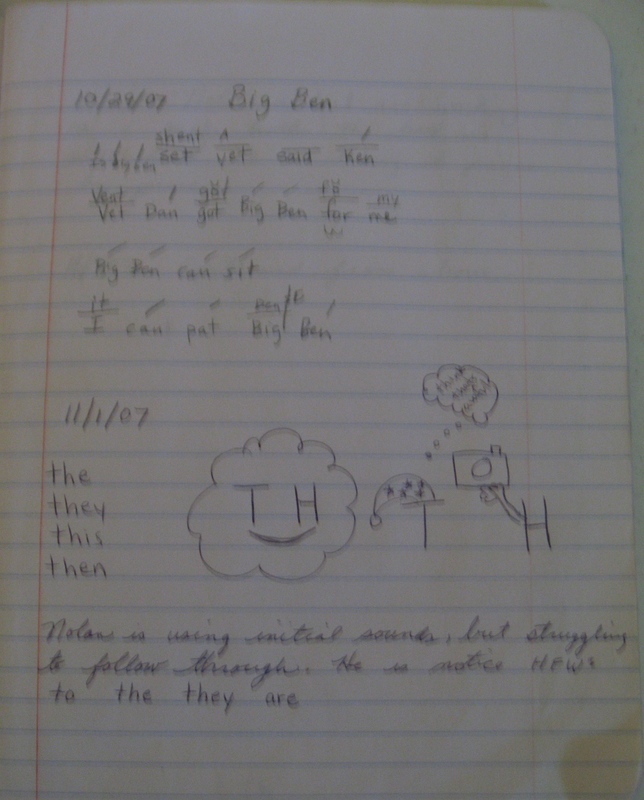 The reader's notebook is a composition notebook where children can record the books they read, their written reflections and store their post it notes to track their thinking. In addition, when I confer with a student I jot down notes about the conference, things we talked about, or record quick running records. I also write down short instructional notes to the student. A note like this might remind them to stretch out words to the end of the word and include a quick sketch of Stretch the stretch it out snake. Using Post it notes to track thinking during the Fabulous Four. 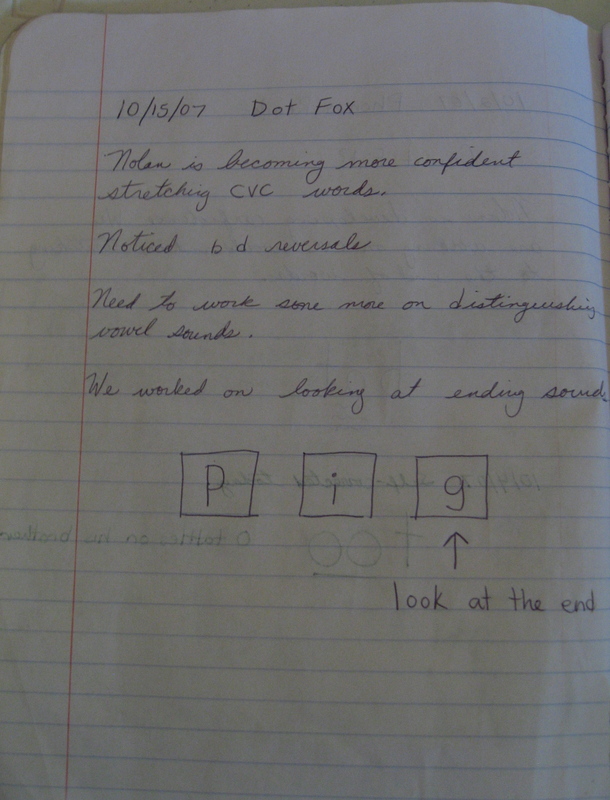 I find the reader's notebook to be an invaluable tool to me as a teacher. It is easy for me to look back quickly and see what I worked on with a child the last time we met and helps me guide my instruction. The notebook also serves as an accountability tool for the students. Once or twice a week I ask kids to leave their notebook out at the end of the day and leave it open to the page they worked on that morning in reader's workshop. After the students leave I can quickly walk around and note how the children are doing.